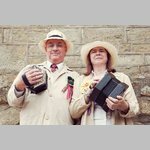 We welcome back Keith Kendrick and Sylvia Needham from Derby who can be relied upon for fine harmony singing, coupled with some wonderful concertina playing They are equally at home with a ballad, shanty or a Music Hall ditty. They will be lots of opportunity for you to join in. This replaces Mal Waite who has had to cancel due to illness.